A beautiful setting. We’re not just talking about the rings. This is the top reason brides have been selecting Mesa, Arizona as their destination of choice for their most memorable day. 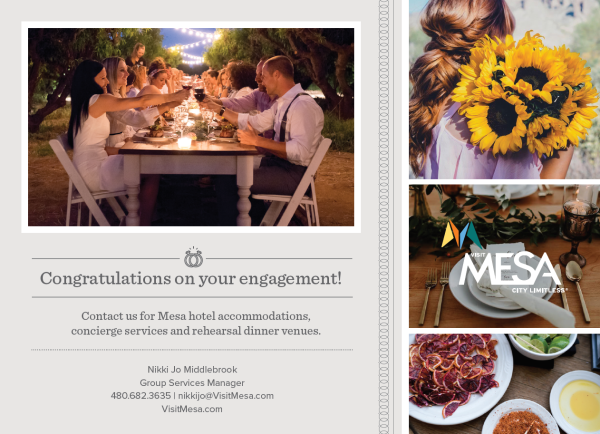 Visit Mesa is a one-stop resource for brides in the East Valley. Our destination experts will help clear through the clutter of wedding planning and showcase the variety of accommodations, award-winning wedding and special event venues and preferred vendors throughout our city. From A to Z, we’ve got your special day covered. Contact our destination experts to support your wedding plans in Mesa, Arizona.